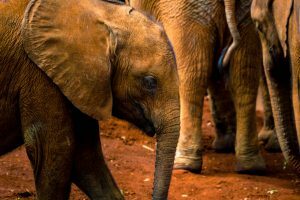 A highlight for many of our clients is a visit to the David Sheldrick Wildlife Trust (DSWT) in Nairobi, Kenya. This outstanding organization rescues orphans and hand-raises them around the clock until they are old enough to be released back into the wild. The public are allowed to visit at 11am when the babies come for their midday feeding and mud bath, always a joyous occasion to observe. Foster an elephant and you can have an exclusive visit at 5pm – Susan did this when she visited in May 2018, and you can read her report here. The DSWT was founded in 1977 by the late Dr Dame Daphne Sheldrick in memory of her husband, a famous naturalist in Kenya. She was the first person to hand-rear an orphaned baby elephant and it took nearly three decades of trial and error to develop the intense and complex methods that are still used today – including refining a recipe for substitute breastmilk, as baby elephants are utterly dependent on milk for the first two to four years of their lives and continue to drink it for many years afterwards. The project has been an outstanding success, with over 200 orphans rescued and around 100 successfully released back into the wild to date. The project is now run by Daphne’s daughter Angela. The DSWT also run a rhino orphan project, a mobile veterinary program, anti-poaching and de-snaring units, and vital conservation and community outreach projects. 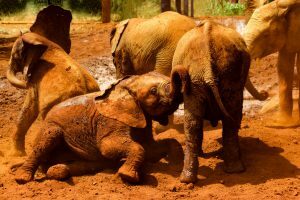 Usually victims of ivory poaching or loss of habitat due to human encroachment, the babies arrive at the orphanage traumatised and grieving and in need of round-the-clock care in order to survive. They are looked after by their ‘keepers’, human surrogates who feed them formula every three hours or so, take them for long walks and even sleep with them at night. Their keepers are rotated regularly so that the babies don’t become overly attached to one particular carer. Like human babies, they require endless patience and affection and love to play. 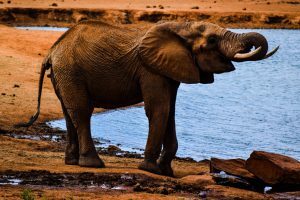 At three or four years of age the orphans are transferred to stockades in Tsavo East National Park or nearby Kibwezi Forest. From here, they’re welcomed by orphan groups that have preceded them, and they start to gradually get to know the wild herds in the area by day while sleeping in the stockades at night. Females usually transition in a group and males on their own. How long this takes varies, but by the time they’re ten years old the process has usually been completed. The orphans will come back to visit their human family for years afterwards and will often seek help if they are sick or injured. The DSWT’s website has regular updates that make for a heart-warming read. Rearing infant elephants and rhinos is an expensive, long-term commitment, and the DSWT is largely funded by contributions from fostering. It costs $50 per couple per year and in return you’ll receive a certificate with your orphan’s profile and history, a monthly summary of his or her progress, and access to a Keeper’s Diary, which has daily entries and regularly updated photographs. You’ll also be kept up to date with the various activities going on at the project – you’re now considered part of the team. Want to know more? Contact us to arrange your visit to the DSWT, and in the meantime, Dame Sheldrick’s autobiography is a must-read.